Do you have a game plan? All winners have a plan of action! What’s yours? As a hero you deserve to BE YOUR BEST! Just like you have a game plan on the job when it comes to your tasks, duties and tactical training in an emergency situation, you should have one on how to win in life. What’s your game plan to BE YOUR BEST…to be a Fit First Responder? What are you doing each day to WIN off the job…to be FIT in your physical, mental, emotional, spiritual, and your relationships? You deserve it and NOW IS YOUR TIME! Here is your very simple game plan to start WINNING right now. Create and execute a daily game plan to GO AND GET IT. A game plan that you will execute to get you to where you need/want to be as a first responder and in life. At FFRonline.tv we’ve got you if you need us, with game plans to win in all areas of your life. Take a few minutes right now to answer the 3 questions above and write the vision and make it plain so that you can run with it hero! Be specific. For example, if you want to be a captain or chief, what are the components necessary for you to become that great leader in your agency? What are you going to do to work on your skill, to develop leadership skills, to perfect your first responder tactics, and so on? You want to be healthier and lose some weight? That’s great! What daily action steps will you execute to get you there? Now is YOUR time! Develop your personal game plan, a concrete action plan detailing the necessary components you will utilize to get what you want in your personal life. You will need to have a game plan for each of the key areas you desire to be FIT in – physical, mental, emotional, spiritual, professional, relational and financial. YOU DESERVE IT! YOU DESERVE IT! YOU DESERVE IT! Today, to be FIT FOR LIFE, you will create your WINNING CONFESSION and professional and personal game plan. I AM THE FINEST. I AM THE BRAVEST. I AM A PERSISTENT AND DILIGENT HERO. I will work hard every day so that I will be THE BEST version of me. I DESEREVE IT! MY FAMILY DESERVES IT. MY AGENCY DESERVES IT. 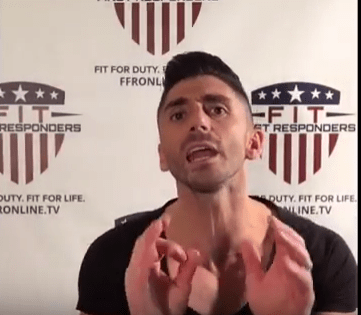 I AM a FIT FIRST RESPONDER! I AM FIT FOR DUTY. I AM FIT FOR LIFE! Coach JC is the visionary of FIT First Responders. Coach JC’s 25 Week FIT for Duty. FIT for Life. Body Transformation “Fit First Responders Program” is so much more than just the physical body. He is transforming lives through fitness, nutrition and the winning mindset. Coach JC has transformed thousands of people’s lives by giving them the tools they need to succeed in life. He has helped clients lose weight, build confidence, improve their marriage, improve their career, get out of debt, overcome limiting beliefs and addictions and overall WIN in life! Through Coach JC’s life coaching service, winning mindset program, books, products, fitness and nutrition programs and 3 businesses and FFR foundation he runs he has hundreds of life changing testimonials.